Besides adding stylish font typography effects, Microsoft Word 2010 also support fancy text effects. 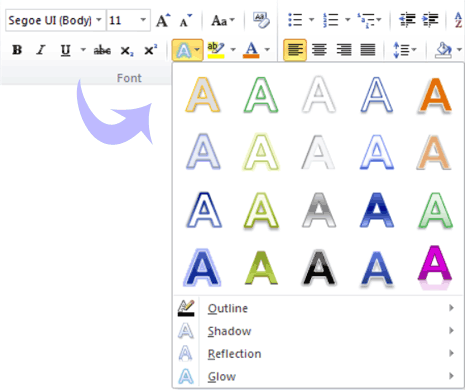 It is an improved, easier and better looking version of Word Art (as seen in previous MS Office). Now you can apply amazing text effects to actual document text and still edit, spell check that specific text with fancy text effect. You can access Text Effects gallery in Word 2010 on the Home tab, in the Font group. For more effects, click the dialog launch icon in the Font group. Then at the bottom of the Font dialog box, click Text Effects. Different type of text effects are available including: gradient fills, custom shadows, reflection, glow, soft edges, bevels. Also a range of preset gallery options are available, allowing you to quickly apply a coordinated set of effects.